My family has a long history with baked beans. More than ten (but less than 15) years ago my three siblings and I piled into the car to head to some family gathering at my grandmother’s house. My mom assigned us each a dish to safeguard in the car on the way there, lest a pie topple over in the trunk. Beans are probably my most favorite of foods. Cheap, tasty, and you get double points because you get to count them as both protein and a vegetable. (Like how your yoga pants also double as regular pants. Ok I don’t actually do yoga but I am sure there are lots of you do.) Black bean burrito bowls, garbanzo bean and grain salads, kidney bean chili, hummushummushummus. Truthfully though, I never much cared for baked beans. So often they are just doctored up canned baked beans, which are just too sweet for my liking. 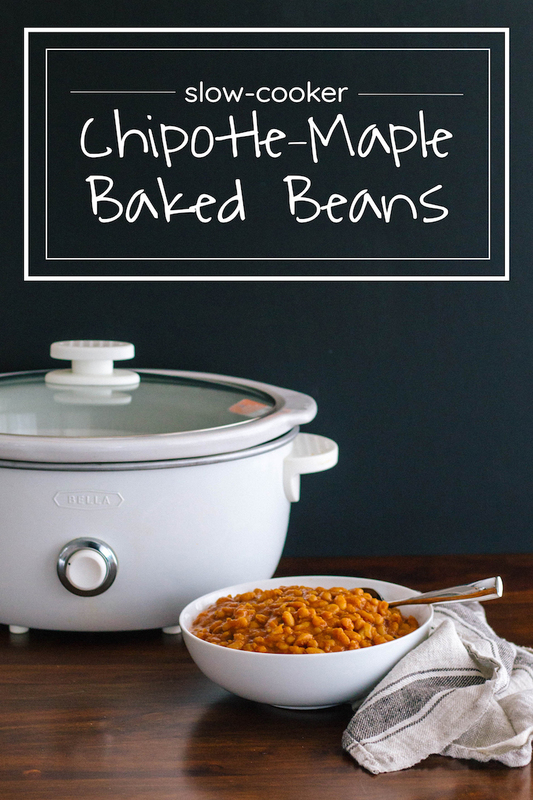 So I tackle my issues with these Slow-Cooker Chipotle Maple Baked Beans. First, that sweetness. While it is key to baked beans, I cut it back significantly here with sweeteners like applesauce, ketchup and a modest amount of real maple syrup. To balance it out, I bring lots of smoky flavors from bacon, a few spoonfuls of spices, and the tiniest amount of kick from chipotle pepper, and brighten it all with a hit of vinegar at the end. Second, let’s address the cooking method. 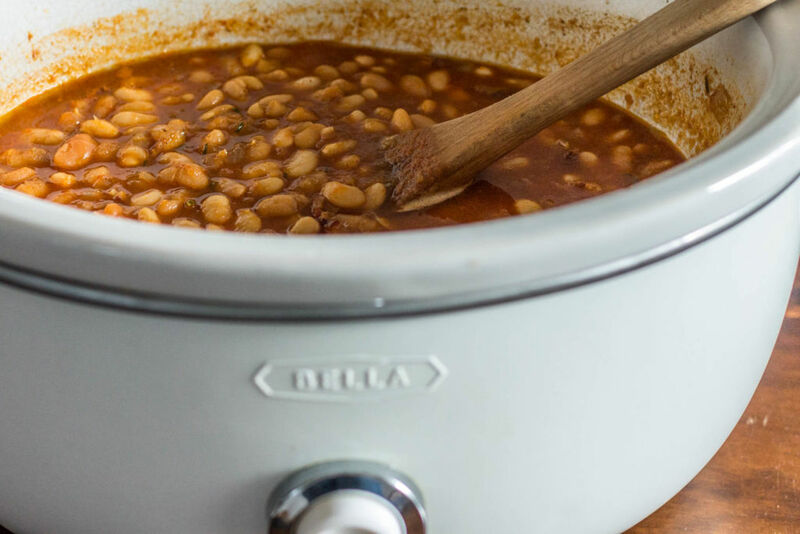 Opening a couple of cans of prepared beans sure is easy, but there are only so many things you can add to prepared baked beans to make them your own, and you certainly can’t take anything away. Instead, start with dried beans and season those little guys to your liking. I promise, cooking dried beans from scratch is just as easy. Which brings me to my next point–you have cooked dried beans before, right? No? Go buy a bag of beans. Or maybe you have bought dried beans before, but not in a while, or you don’t do it very often. “They take so long!” you say. “I never remember to soak them!” you say. Oh right okay. Well it takes me a long time to get through a season of Orange is the New Black when little eyes aren’t around. And I also never remember to move the laundry from the washer over to the dryer, yet somehow everything still gets done and I feel proud and accomplished and like a civilized member of society when I’m done. So like I said. Go buy a bag of dried beans. 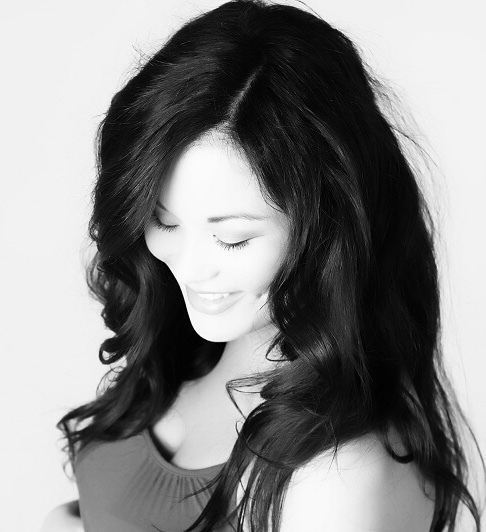 I promise, you can do this. A pound of beans makes a lot, for little effort. Let these slow cooker baked beans simmer along on a Sunday, freeze half of the batch, then eat the rest for dinner on Monday when you’re stressed for time. (They are, in fact, exactly 86.3% better the next day.) Yes, you can spoon these alongside your burgers/hot dogs/ribs/other summertime favs, but please don’t wait for warmer weather. A pot of beans is perfect with good bread and a plate of pickles and cheese for cozy winter dinner, or with soft scrambled eggs, or an egg poached right in the bean pot for breakfast-brunch-lunch, or hell even dinner. Fill a Thermos and tuck them into a lunch box for a warm and hearty lunch for your kiddo going on a cold school day. Almost any medium-small bean will work here. I most often use a generic bag of Great Northerns, or if I'm feeling lush, a bag of Rancho Gordo Yellow Eyes. Both produce excellent results. The canned chipotle here provides a medium hit of background spice. My heat-averse children gobble these up. If you like your food on the spicier side, add another pepper, but I would proceed with caution from there. The applesauce here acts as both a sweetener and thickener, but if you don't have it (sometimes the kids have eaten it all), just add an extra squeeze of ketchup and another glug of syrup. 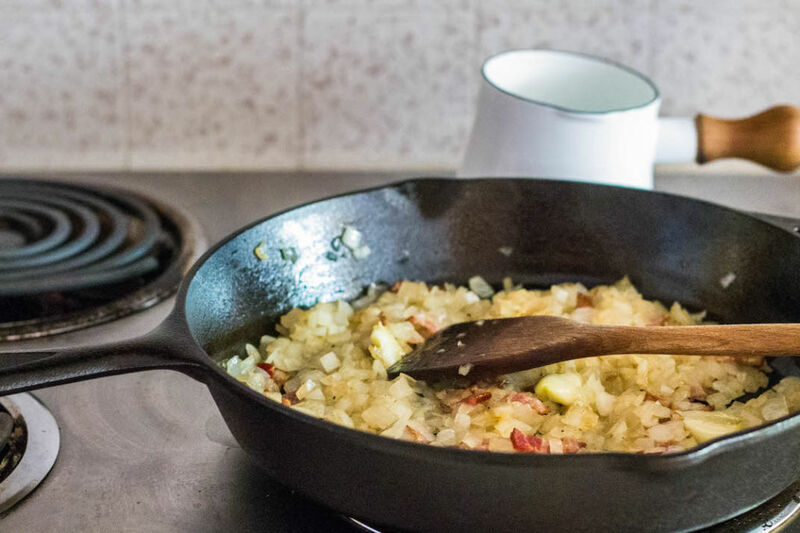 Finally, pork and beans are a classic pairing, but if you'd rather skip it, just use a tablespoon of oil instead. Heat a large pan over medium heat. Chop the bacon and add to the pan. Cook 5-7 minutes, or until the fat has rendered out and the bacon is beginning to crisp. Meanwhile, chop the onion and garlic. Add them to the pan once bacon has started to crisp. Continue to cook over medium heat until the onion becomes translucent, about 12-14 minutes. 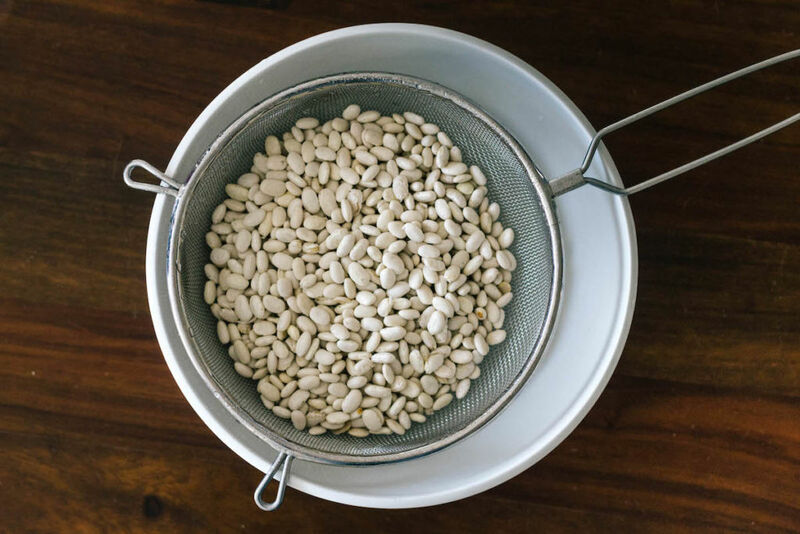 While the onions cook, pick over your dried beans for any small rocks or debris, and rinse in a colander. 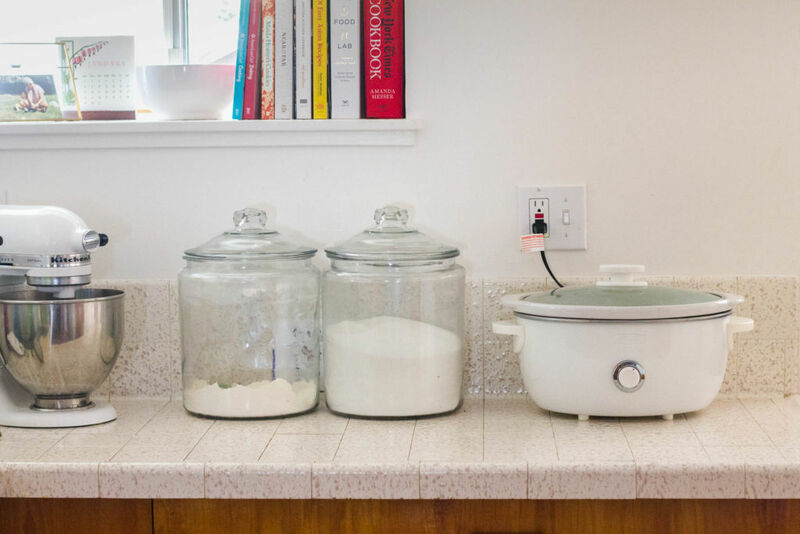 Add to the slow cooker. Once the onions are translucent, stir in the chili powder, cumin, and smoked paprika and stir. Cook another 30 seconds, or until the spices become fragrant. 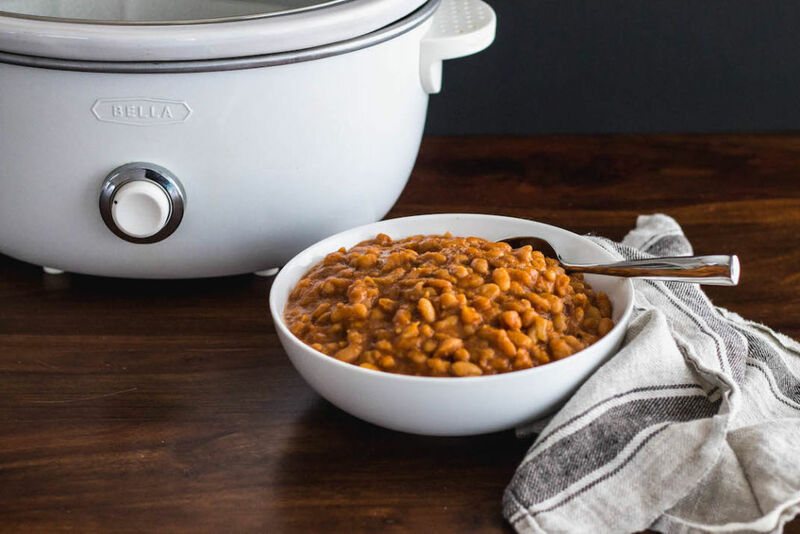 Add to the slow cooker with the beans. Add the rest of the ingredients *except* the vinegar to the slow cooker. (I find it easiest to measure all of these ingredients in a 2-cup liquid measuring cup.) Add six cups of water. Give everything a good stir, cover, and set on high for 6-8 hours. Once the beans are done cooking, remove the bay leaf and chipotle pepper and discard. Stir in the vinegar. Perfectly lovely as is, but even better the next day. 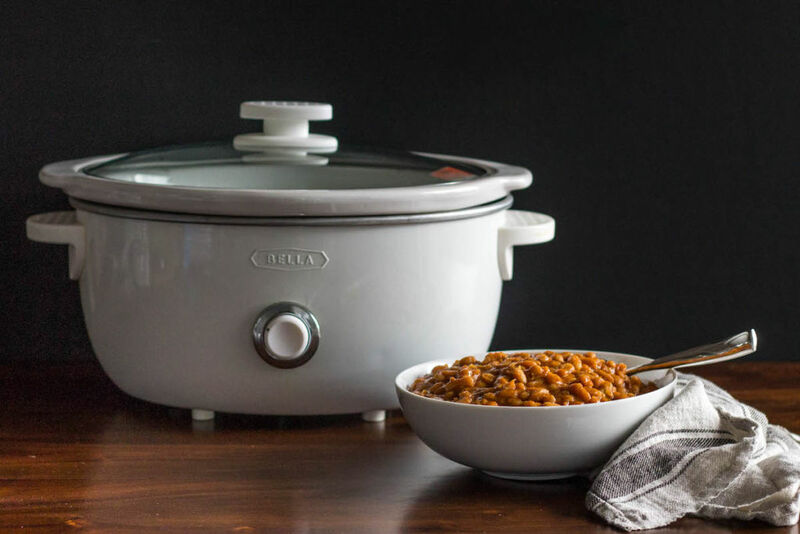 Cooking times: Both the age of your beans and your individual slow cooker can really affect cooking times. Fresher beans can cook in as little as four hours, older beans can take twice that long. I would advise checking them at four hours. Taste a few spoonfuls, not just a bean or two, to check doneness. At this point, either turn off the pot if they are done, or add more water (if the water level is low) and continue to cook until done.